Get ready to feel all the feels, because this story will restore your faith in the power of community. When an electrical fire left Bradley Parker’s house in ruins, he thought he had no one to turn to and no place to stay. But it turned out the help he needed was all around him: After a good half hour of his neighbors all just kind of standing around and looking at each other, one of them finally spoke up and reluctantly offered to let Bradley crash at his place. Thank goodness for the kindness of neighbors. As Bradley’s neighbors gathered on the street to watch firefighters extinguish the blaze, they quickly realized that one person among them was probably going to have to step up and offer Bradley a place to stay for the night. Glancing around at each other to gauge whether anyone else was going to make a move, they kept quiet as they tried to remember if anyone else seemed to know Bradley very well, or perhaps had a guest room. Finally, after a protracted period of waiting for someone else to speak up, Bradley’s next-door neighbor Kenneth Wu walked over and let him know he could crash on his couch for a few days if need be. It was as simple as that. 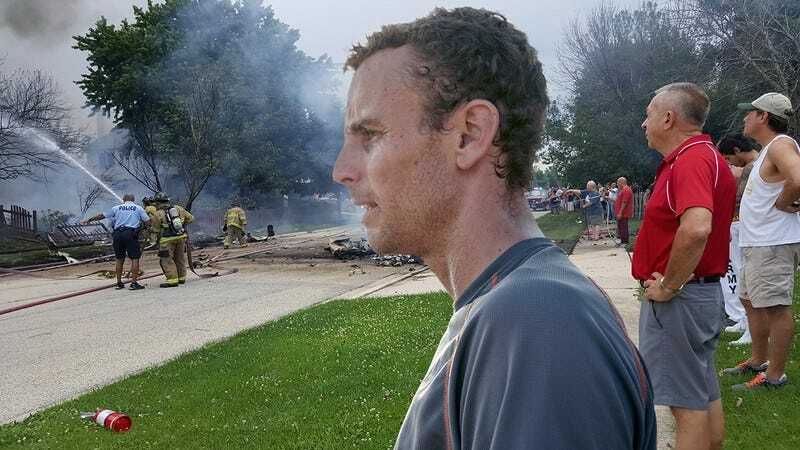 Kenneth saw Bradley was in trouble, waited through 10 minutes of tense silence as his neighbor watched his possessions turn to ash, and then sprang into action. Absolutely inspiring. As if that weren’t enough, after Kenneth offered up his home, several other neighbors also hollowly chimed in that they, too, had couches Bradley could stay on. And as Kenneth told Bradley that he’d only be able to stay until Friday because he had a cousin coming into town, another neighbor said that Bradley could probably stay with her Friday onwards, if he really hadn’t found a more permanent situation by then, but she’d have to check with her boyfriend first. Wow. What an incredible outpouring of love in the face of tragedy. It’s comforting to know that when things look dark, social obligation will ultimately force your neighbors to extend a basic kindness.